The month of May is national electrical safety month. This is when we need to be more vigilant on electrical safety at work and home. Electrical injuries can be painful and in some cases fatal. According to the Bureau of labor and statistic data compiled by Electrical Safety Foundation International (ESFI). They claim that in the workplace there are over 154 deaths each year from electrical shock. At home electrical fires and the leading causes of house fires. At home, electrical fires are the leading cause of house fires. 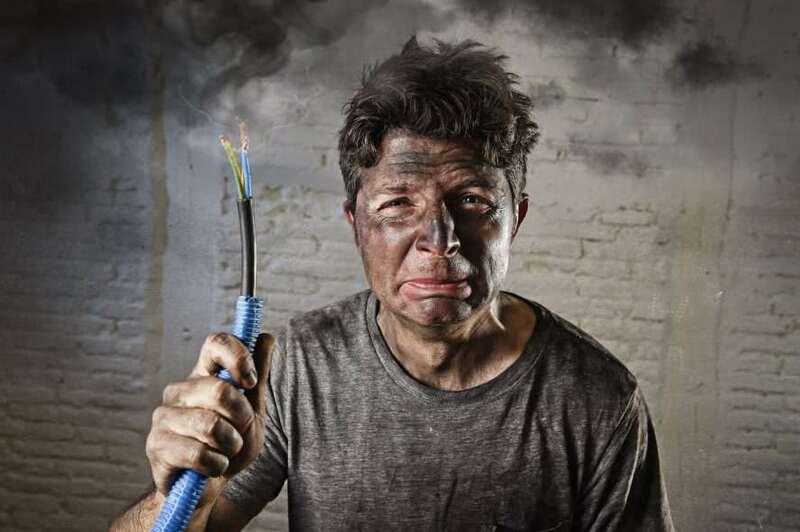 Electrical fires are caused by faulty wiring or an overload on circuits. ESFI has a list of ways to prevent these fires from happening in everyday households. Have your home electrical system thoroughly inspected by qualified electricians to ensure that all electrical work in the home meets the safety provisions in the NEC. Install smoke detectors on every level of the home, inside each bedroom, and outside each sleeping area. Ask a qualified electrician if your home would benefit from AFCI protection, especially during inspections of older homes or upgrades to electrical systems. These advanced new safety devices recognize dangerous conditions that are not detected by standard breakers. Test smoke detectors and AFCIs monthly to ensure that they are working correctly. Establish an evacuation plan that can be used in case of an emergency, and practice with your family. Use light bulbs that match the recommended wattage on the light fixture. In homes with young children, install tamper-resistant receptacles to prevent electrical shocks and burns. Conduct a basic assessment of your home electrical system, electrical cords, extension cords, power plugs, and outlets. Look for telltale signs of electrical problems such as dim and flickering lights, unusual sizzling and buzzing sounds from your electrical system, insulation and circuit breakers that trip repeatedly. Contact a qualified electrician immediately. Use extension cords only temporarily, and never with space heaters or air conditioners. Avoid overloading outlets. Consider having additional circuits or outlets added by a qualified electrician as needed. How do we stay safe at work from Electrical injuries? In a work environment, you need to be more vigilant on electrical dangers. The reason is that equipment is in constant work and can become faulty quickly and then become dangerous to the user. There are a few steps to take in being safe when at work from electrical equipment. Always look for wires that are damaged. Make sure a circuit is using the proper power load as recommended by the equipment manufacturer. If electrical equipment is acting faulty, then shut it down and secures it so no one else can use it again. OSHA has a few best practices to prevent electrical injury. Stay at least 10 feet away from overhead wires during cleanup and other activities. If working at heights or handling extended objects, survey the area before starting work for the presence of overhead wires. If an overhead wire falls across your vehicle while you are driving, stay inside the car and continue to operate away from the line. If the engine stalls, do not leave your vehicle. Warn people not to touch the vehicle or the wire. Call or ask someone to call the local electric utility company and emergency services. It is best to remind your fellow employees to think safety first before performing any work. If you there is an electrical shock emergency, then you need to make sure the equipment is shut down and locked out. Then you may have to treat the victim with CPR and the use of an AED. The Beating Heart Center can provide more of this training for you. If the victim is with an electric burn, be sure to place it over water and was clean. Then cover the wound and send the person to medical for further evaluation.